Each income orientated investor need a high cash source in order to satisfy his needs of income. Major sources on the capital market are dividends. Those are payments by the corporate to its shareholders. Dividends should be reliable and grow. That's a major reason why dividend growth has an essential meaning for investors. A long history of rising dividends and sustainable payments increases the trust relationship to the owners of the company. 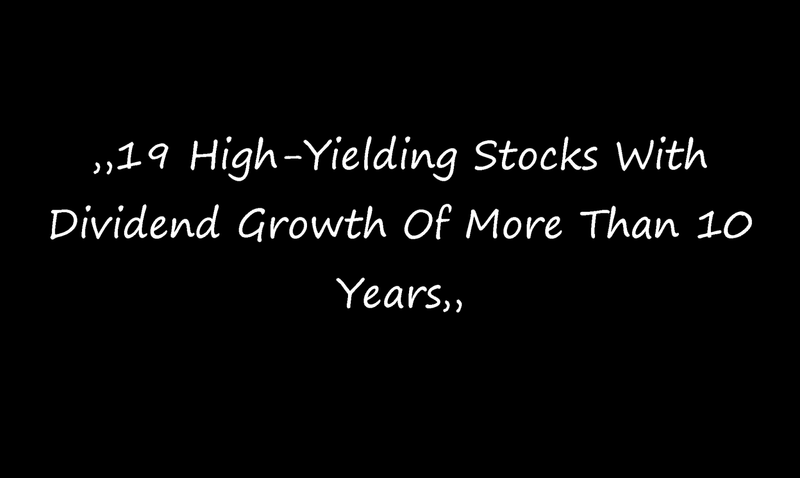 Today I want to show you the highest yielding dividend growth stocks with a consecutive dividend growth history of more than 10 years in a row. 19 stocks with yields above the High-Yield mark 5 percent fulfilled my criteria of which three have a low forward P/E. If you like more ideas, please look at the list of High-Yield Large Caps of the stock market. There are a lot of solid dividend growth and value companies on it. Which stocks do you like from the screen? TransMontaigne Partners (NYSE:TLP) has a market capitalization of $590.48 million. The company employs 584 people, generates revenue of $158.89 million and has a net income of $34.73 million. TransMontaigne Partners’s earnings before interest, taxes, depreciation and amortization (EBITDA) amounts to $69.61 million. The EBITDA margin is 43.81 percent (the operating margin is 24.18 percent and the net profit margin 21.86 percent). Financials: The total debt represents 32.69 percent of TransMontaigne Partners’s assets and the total debt in relation to the equity amounts to 51.90 percent. Due to the financial situation, a return on equity of 8.96 percent was realized by TransMontaigne Partners. Twelve trailing months earnings per share reached a value of $1.77. Last fiscal year, TransMontaigne Partners paid $2.58 in the form of dividends to shareholders. Market Valuation: Here are the price ratios of the company: The P/E ratio is 20.66, the P/S ratio is 3.74 and the P/B ratio is finally 1.69. The dividend yield amounts to 7.22 percent and the beta ratio has a value of 0.29. AT&T (NYSE:T) has a market capitalization of $180.20 billion. The company employs 247,700 people, generates revenue of $132,447.00 million and has a net income of $6,518.00 million. AT&T’s earnings before interest, taxes, depreciation and amortization (EBITDA) amounts to $32,139.00 million. The EBITDA margin is 24.27 percent (the operating margin is 8.87 percent and the net profit margin 4.92 percent). Financials: The total debt represents 28.03 percent of AT&T’s assets and the total debt in relation to the equity amounts to 95.02 percent. Due to the financial situation, a return on equity of 7.02 percent was realized by AT&T. Twelve trailing months earnings per share reached a value of $1.19. Last fiscal year, AT&T paid $1.84 in the form of dividends to shareholders. Market Valuation: Here are the price ratios of the company: The P/E ratio is 29.10, the P/S ratio is 1.36 and the P/B ratio is finally 2.08. The dividend yield amounts to 5.42 percent and the beta ratio has a value of 0.39. HCP (NYSE:HCP) has a market capitalization of $19.61 billion. The company employs 170 people, generates revenue of $2,266.28 million and has a net income of $893.19 million. HCP’s earnings before interest, taxes, depreciation and amortization (EBITDA) amounts to $1,799.50 million. The EBITDA margin is 79.40 percent (the operating margin is 58.35 percent and the net profit margin 39.41 percent). Financials: The total debt represents 45.67 percent of HCP’s assets and the total debt in relation to the equity amounts to 90.91 percent. Due to the financial situation, a return on equity of 8.31 percent was realized by HCP. Twelve trailing months earnings per share reached a value of $1.94. Last fiscal year, HCP paid $2.18 in the form of dividends to shareholders. Market Valuation: Here are the price ratios of the company: The P/E ratio is 22.36, the P/S ratio is 8.70 and the P/B ratio is finally 1.84. The dividend yield amounts to 5.27 percent and the beta ratio has a value of 0.47. BHP Billiton (NYSE:BBL) has a market capitalization of $133.12 billion. The company employs 47,044 people, generates revenue of $67,206.00 million and has a net income of $15,224.00 million. BHP Billiton’s earnings before interest, taxes, depreciation and amortization (EBITDA) amounts to $30,977.00 million. The EBITDA margin is 46.09 percent (the operating margin is 34.84 percent and the net profit margin 22.65 percent). Financials: The total debt represents 22.84 percent of BHP Billiton’s assets and the total debt in relation to the equity amounts to 43.70 percent. Due to the financial situation, a return on equity of 18.47 percent was realized by BHP Billiton. Twelve trailing months earnings per share reached a value of $5.18. Last fiscal year, BHP Billiton paid $2.42 in the form of dividends to shareholders. Market Valuation: Here are the price ratios of the company: The P/E ratio is 9.45, the P/S ratio is 1.98 and the P/B ratio is finally 0.65. The dividend yield amounts to 4.96 percent and the beta ratio has a value of 1.61. *I am long T. I receive no compensation to write about these specific stocks, sector or theme. I don't plan to increase or decrease positions or obligations within the next 72 hours.